1) GET HIM OUT OF THERE! !…..TIM TEBOW ISN’T READY YET!! It is amazing how much fan-love Tim Tebow gets on a weekly basis, like he is gods-gift to the Quarterback position. No, that wasn’t a shot at his religious beliefs by the way. Tim Tebow must have thought Halloween came a day early on Sunday, because he dressed himself up as an NFL Quarterback. It is fun to dress up on Halloween, isn’t it? The truth of the matter is this. 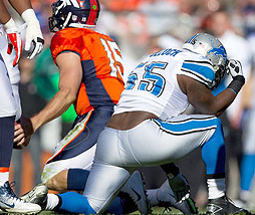 Tim Tebow has been thrown into the Lions den (Literally on Sunday). He doesn’t have the proper mechanics at this point and time to be an efficient QB in this league. The only reason he is on the field in the first place is because John Fox and the Broncos coaching staff succumb to the pressure of the fans. The Broncos weren’t winning Football games, and the chants of “WE WANT TEBOW” would echo through the Sports Authority Field at Mile High. Fans didn’t realize that Tebow was actually 3rd on the depth chart, behind then starter Kyle Orton and backup Brady Quinn. This was a PR move plain and simple to get the fans back on their side. Unfortunately, it wasn’t a Football move. Through his two starts, Tebow is 1-1 with 4 Passing Touchdowns including 1 Rushing. The more IMPORTANT numbers are his 4 fumbles, 46.1% completion rate and his 13 sacks. Watching him throw the football is just incredibly awkward, because his mechanics are just dreadful. He did orchestrate a nice 4th quarter comeback against the Dolphins, but A) The Dolphins aren’t exactly blowing up the league with their ability at this point, as seen on Sunday as they blew yet another lead against New York, and B) for 3 and a half quarters, Tebow was completely off and looked like a deer in the headlights. This past Sunday against Detroit, Tebow got sacked 7 times, connected on less than half of his passes, and only threw the ball for 172 yards, most of which came in the 4th quarter. The kid needs time to learn his craft. He was successful in College, winning 2 national championships for Florida, but the game is so much different in the pros. Tebow was able to disembowel defenses with his unique ability to run the ball (which he can do in the NFL fairly well), but that can only take you so far in this league. You need to be able to throw the ball effectively. Tim can’t do that, at least right now. Can he learn to be a proper Quarterback over time? Absolutely. The key words are “over time”. As for right now….get him out of here. 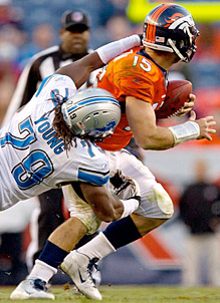 While we are on the subject of Tim Tebow, I would just like to say that all of the fans out there who are upset over the Detroit Lions “Tebowing” after sacking the Quarterback on Sunday need to seriously relax. For those who don’t know what it is to “Tebow”, it is to get on one knee and act like you are praying, in a similar fashion to what Tebow did after the Broncos win over the Dolphins 2 weeks ago. They weren’t slighting god or being religiously offensive. Everyone understands that Tebow is a religious man and a man of God, but I truly don’t believe that what the Lions did was crossing any lines. As Linebacker Stephen Tulloch said on his Twitter on Monday…. Seriously? The St. Louis Rams? The Rams went into Sundays game with 0 wins. Not 1, not 6, but a big, fat 0. They even had A.J Feeley starting at Quarterback. No disrespect to Mr. Feeley, but there is a reason he isn’t a Starting QB in this league anymore. Easy win for the Saints right? The Saints went scoreless in the 1st half, which was the first time all season that has happened. Drew Brees got sacked a total of 6 times. 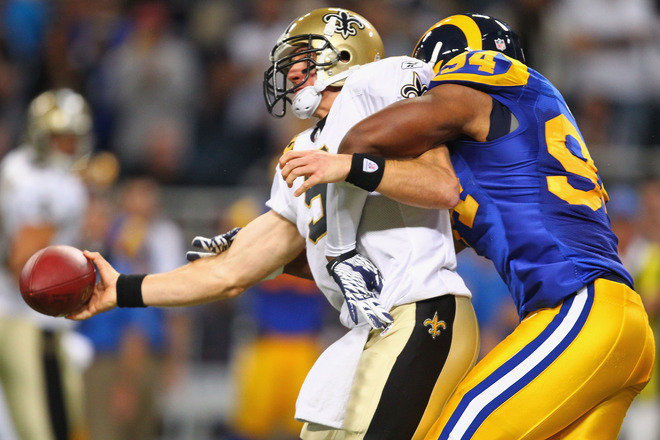 Going into the game, the Rams defense had a total of just 11 sacks. The Rams secondary was banged up, missing 3 of their starters. Yet they found a way take the Saints vast amount of solid receivers out of the game. 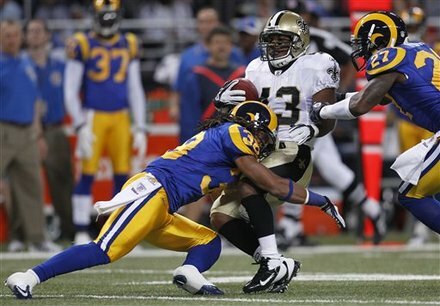 Rams RB Stephen Jackson had his first 100 yard rushing game in 3 seasons, carrying the ball 25 times for 159 yards and 2 Touchdowns, dominating the Saints defense on the ground. Many may chalk it up to a mental letdown. The team had just come off of a 62-7 throttling of the Colts, and you can even make the case that the Rams are WORSE than the win-less Colts at this point. You could also say that the Saints went into the game with a bit of a chip on their shoulders, believing that the Rams would be a cakewalk. The beautiful thing about sports is that on any given night, any team can beat any other team. That is just the way sports are. They are all athletes. They all know what they are doing. Some just know it better than others, that’s all. The Rams played the perfect game to defeat the Saints. They brought their A+ game and they delivered, and that is why they walked away with the win. If the Saints want to make any noise in the NFC, then they have to stop losing games like this. Remember, it was just last season where the Saints lost to a far inferior team in the Seattle Seahawks in the opening round of the playoffs. It may just be 1 game, and perhaps next week the Saints will dominate in the way we are accustomed to and right the ship. However, you are only as good as your last game. I put a lot of stock in Sunday’s Pittsburgh Steelers vs New England Patriots game. Right now, there isn’t really a clear cut idea of who is going to come out of the AFC. Everyone is just jumbled together in the middle of a very crowded pack. I believed this game would give me a better indication of who the favorites should be to represent the AFC in the Super Bowl. The Steelers gave me plenty of reason as to why they should be at the top of the AFC Totem Pole after Sundays game. The Steelers showed that in every aspect of a Football game, that they could dominate you. The Patriots are obviously not a pushover, they are far from it. Pittsburgh torched the New England secondary through the air, as QB Ben Roethlisberger gained 365 Passing Yards, 2 Touchdowns and got the ball to 9 different receivers, including 9 receptions for Antonio Brown. They ran the ball effectively with “The Undertaker” Rashard Mendenhall, and the defense was able to keep a top-3 QB in Tom Brady under 200 yards passing. At this point in the season, I don’t see any 2 teams in the AFC more likely to get to the Conference Title game than Pittsburgh and New England. The Steelers win over the Pats gives them momentum and much needed confidence that come playoff time, they can handle Tom Brady and the Patriots in a more important scenario. With no one having any real confidence to pick a NFC title winner that isn’t named the Green Bay Packers, I believe that we may be seeing a rare Super Bowl rematch between Green Bay and Pittsburgh. The Steelers have a fairly easy schedule the rest of the way, with 2 games each against the Browns and Bengals, as well as games against the Chiefs and lowly Rams. The road to the Super Bowl could be an easy one for the black and yellow, If the team can stay healthy and avoid any late season meltdowns, how could you not like their chances? My thoughts on your thoughts. 1. Tebow may not be a great QB right now, but the fact of the matter is the Broncos have some serious holes to fill. You talk about Tebow being sacked 7 times and you don’t mention the O-Line playing dreadfully. 2. Saints seem to have had consistency problems the last few years since they wont the Super Bowl. This is a perfect example of it. 3. If the Steelers make it to the Super Bowl it would be the worst thing in football. 1) Absolutely the Offense Line is in complete shambles. Some of the blame can be placed on Tebow holding on to the ball to long though. Watching him play, I see a Quarterback who isn’t confident in throwing the ball. He takes to long to think. Yes, it is the job of the O-Line to give him time, but it is also the job of the QB to think on his feet and execute properly, which Tebow can’t do at this stage in his career. With a team with as many holes as the Broncos, you at least need a QB who has some idea what he is doing. He can be a good QB down the road, but tossing him out there now before he has the proper mindset and mechanics to be a NFL QB isn’t helping his development. 2) I agree, the Saints have no consistency at all. They have all of the talent to be up their with the Packers for best in the NFL, but their mental strength as a team is holding them back, as they keep losing to horrible teams. Definitely a hurdle they need to overcome if they want to go deep in the playoffs. 3) I used to be on that mindset. The Steelers are the team you just hate to see in the Super Bowl. They were the tough, grind it out team who were never as flashy as say a Brady-led Patriots, or Manning and the Colts, or even Rivers and the Chargers. But you can’t take away the fact that they were one of the best teams in the league who have very few weaknesses at this point. The best team in the AFC should be in the Super Bowl, and right now that team is the Steelers. 1) Some blame definitely is placed on Tebow, I don’t disagree there, but I think that it needs to be distributed. One thing I don’t like is that if Sam Bradford were to play a game like Tebow played Sunday people would just say “Oh, he’s a young QB, he’s learning,” but when Tebow does it, people say “He stinks, not ready for the NFL, get him out, blah, blah, blah.” It’s a double standard. They’re both second year players. Just my opinion, I don’t think Tebow is great ATM, but cut him some slack. Also, the Broncos aren’t re-signing Orton, so there’s no point going back down that road, but I could see them giving Quinn a chance. 2) I think we agree here. 3) They have a good D and good running game. 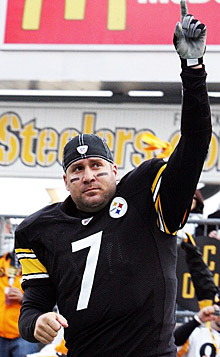 I can’t stand “Big Ben” though.